The Facebook logo font has become one of the most known fonts in the world simply because of the enormous popularity of Facebook. 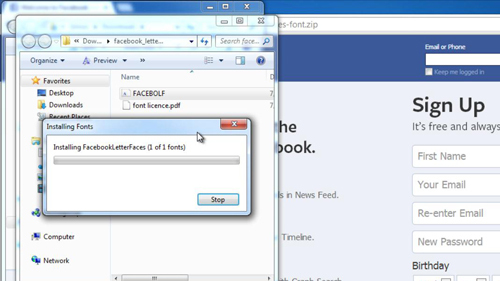 This tutorial is going to show you how to get the font for Facebook logo and use it in a document. The Facebook logo font is actually unique and it has been tweaked by the company and is not publically available. That said, like with many fonts, there are several alternatives which are almost indistinguishable from the real thing. You need to open your web browser and visit “http://www.mediafont.com/download-11-facebook_letter_faces-font.zip”. 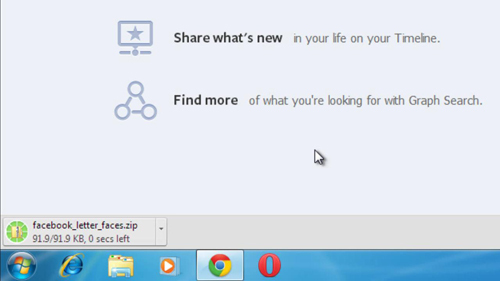 A zip file will download to your computer. Click on the small arrow next to the downloaded file and then click “Show in folder”. Use your preferred extraction software to extract the zip file and a file called “FACEBOLF.OTF” will appear – this is the font that we need to install. Right click on it and click “Install”. The font will be installed. Now we are going to use the font to make sure that it has installed correctly and looks good. Open any text editing program (here we are using Wordpad) and from the fonts drop down option select “Facebook Letter Faces” and then enter some text. 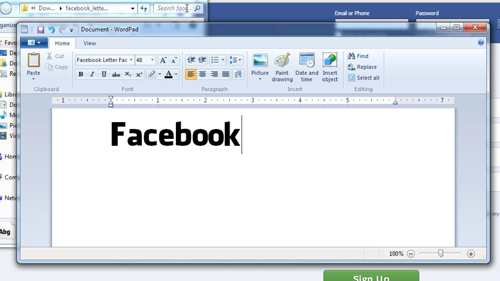 As you can see it is a good replica of the Facebook font and that is how to get the font for facebook logo.